A not to be missed attraction in Kuala Lumpur, is the city’s landmark ‘Kuala Lumpur Lake Gardens’ complex. This verdant, green lung which encompasses 91.6 hectares of lush green landscape is built around an artificial lake and features the concept of a garden within a garden with its several individual gardens. 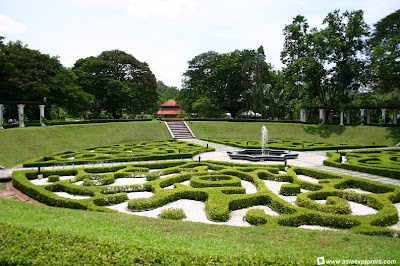 The founding of the Kuala Lumpur Lake Gardens or Taman Tasik Perdana dates back to the 1880s. Enclosed within this garden complex are additional attractions like facilities for cultural and musical performances, a children’s playground, jogging paths, exercise stations and boating facilities. Set up to resemble a rainforest, the leafy butterfly park is home to 15000 plants belonging to more than 100 species. The park which also includes a nursery and breeding center is said to host more than 120 species of multi-hued butterflies, which never fail to enchant and delight visiting hordes. The twin Orchid and Hibiscus gardens are situated on a small hillock within the Lake Gardens and showcase numerous varieties of these gorgeous, tropical blooms. Touted to be the largest bird park in S.East Asia, the Kuala Lumpur Bird Park, also hosts the world’s largest walk-in aviary, populated with nearly every major species from Asia. The Malaysian National Monument, believed to be one of the world’s largest freestanding bronze sculptures, commemorates those who lost their lives during Malaysia’s struggle against communist insurgency in the 1950’s. Located near the sculpture are other attractions like the ASEAN garden and the Memorial Tun Razak, a small museum dedicated to Malaysia’s second prime minister, the Late Tun Abdul Razak Hussain. The Deer Park located is located along the rolling slopes and sprawling valley of the Lake Gardens. This delightful deer sanctuary hosts a sizeable population of the native mousedeer; the worlds tinniest hoofed animal which features prominently in Malay folklore. The Deer Park is open to the public from 9am to 5pm daily. Carcosa Seri Negara is a luxe hotel situated on a hilltop within the Lake Gardens. This luxury hotel is housed within two magnificent, adjacent colonial mansions which date back to the 19th century. The Carcosa Seri Negara once served as the home of the British Governor and the British High Commissioners. Today however, this magnificent edifice is home to a luxury hotel.